If you’ve been in hibernation this winter, or traveling in some remote location with no internet access, then perhaps you haven’t heard of Pinterest. For the rest of us its been impossible to ignore as its the hottest thing since Paris Hilton ignited a media frenzy oh so many years ago. 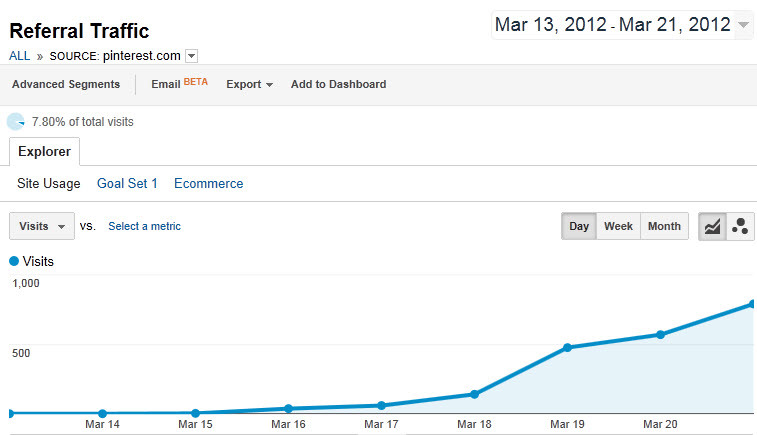 UPDATE 2: Referral traffic from Pinterest continues growing rapidly and is approaching 1,000/day. Some of the categories people are pinning it under include Good Cheap Ideas, All Things Fun and Free, Being Frugal and Vacation Ideas. 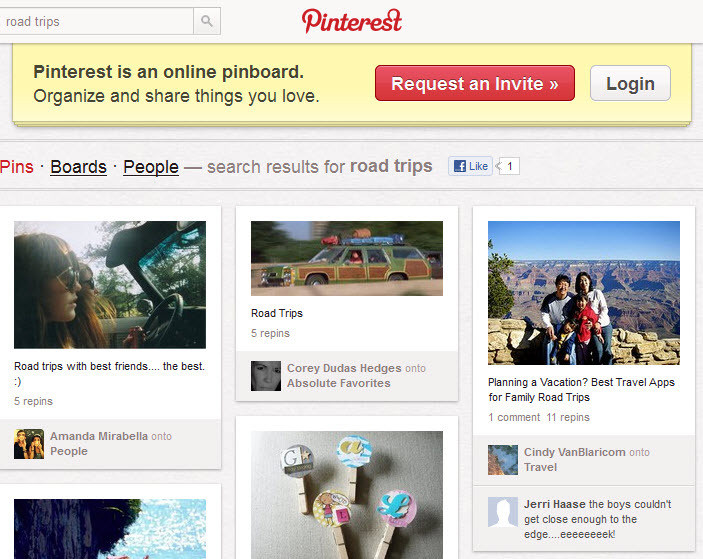 So what has people so excited about Pinterest that some in the media claim it represents a valid threat to Facebook? Is it the beautifully simple design combined with the stunning images that people are pinning? Or is it the viral hooks that make it easy to share through social media. Or perhaps it satisfies an innate need in all of us to organize our desires (as in bucket lists) and pinning images is so much more fun than typing text? I’m not exactly sure why Pinterest has taken off the way it has, but some other similar bookmarking services such as de.li.cious and StumbleUpon have seen rapid growth in the past. Regardless of the reason, every social media pundit on the planet is sounding the alarm that if you run a consumer business you’d better get plugged into Pinterest ASAP lest you get left behind as stories are already circulating about Pinterest driving enormous volumes of traffic to sites. 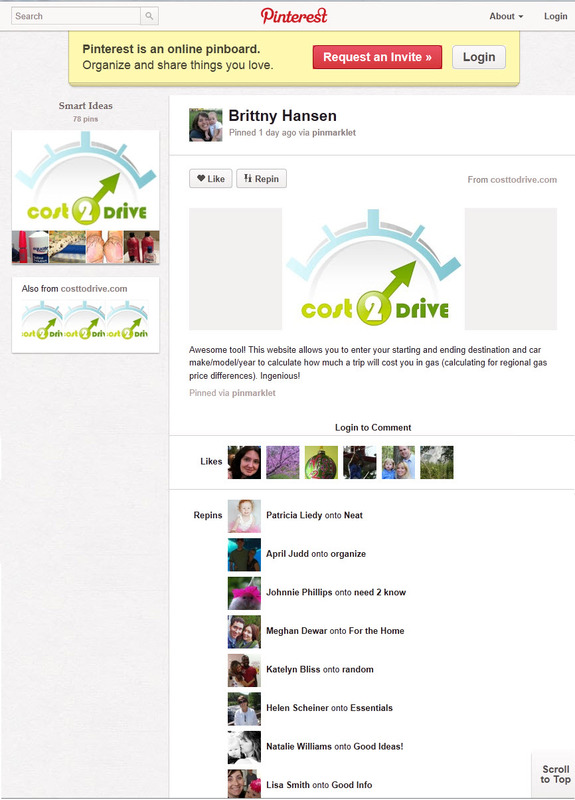 As for us, we were struggling to find a reason why someone would pin Cost2Drive on Pinterest and so were very pleasantly surprised to find people are already doing just that as yesterday we notice 23 people had pinned the site under the category of Smart Ideas. Maybe those pundits are right. Rest assured we’ll be taking a closer look into Pinterest. If you’re still struggling with what Pinterest is all about, Business Insider has an excellent tutorial where you can learn more. This entry was posted in Uncategorized and tagged Frugal, gas prices, Pinterest, Smart Ideas, Social Media. Bookmark the permalink. Interesting stuff. What do you attribute the growth to? Setting up and managing your own page or organic increase in pins from existing Pinterest users? Something else? We’ve done nothing specifically to draw in Pinterest users. My guess is that it has to do with how we designed the site for a female audience, which seems to be the majority of Pinterest users. A free t-shirt for anyone who can guess what it is about the site design that was focused on this audience.